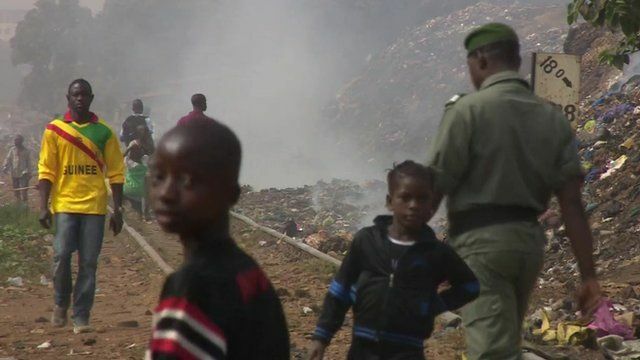 Guinea's Ebola culture battle Jump to media player The BBC's Ibrahima Diané returns to his home country to look at the particular problems facing Guinea in its fight against Ebola. World's 'epic battle' against Ebola Jump to media player The head of the UN team fighting Ebola, Anthony Banbury, says the outbreak will be ended in 2015 but admits the end is "not close". Ebola orphans cast out by communities Jump to media player Many children orphaned by Ebola are being shunned by their communities over fears they may bring the disease back with them. How hot is it inside Ebola gear? Jump to media player The BBC's global health correspondent Tulip Mazumdar tries on full protective equipment whilst at an Ebola treatment centre in Freetown, Sierra Leone. As west African counties continue to fight the Ebola epidemic, Guinea is facing particular problems. Some there believe the disease has been made up by western doctors, in order to sell medicine. Medical teams have been attacked by hostile crowds and many survivors face social rejection. The BBC's Ibrahima Diané returned to his home country to see why there is still so much resistance.